Talley Fisher specializes in suspended sculpture. Her work brings dazzling groupings of anodized metallic colors or strong, large and vibrantly colored powder coated sculptural elements to the lobbies and atriums in which they reside. Positive and uplifting, largely based on the natural world, her hanging sculpture creates signature works of art for her clients. Commissioned as public art sculptures, the Indianapolis and Las Vegas International Airports host four airport art projects that Talley worked on with her sculptor father, Rob Fisher. After his sudden death in 2006, she fabricated, engineered and installed one large-scale hanging sculpture for the Indianapolis International Airport in 2008, as well as three monumental suspended sculptures for the McCarran International Airport Terminal 3, Las Vegas in 2012. Talley’s international art commissions have come from hotels, clubs, and residential buildings in Hong Kong, Macau, China, Nassau, and a Desert Museum in the United Arab Emirates. 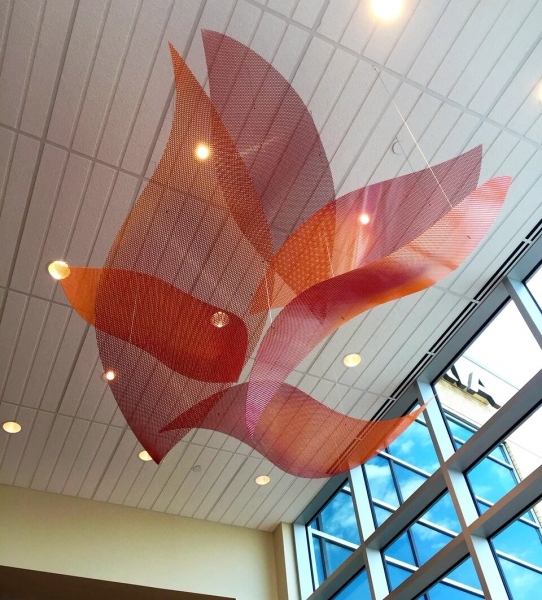 These sculptures, hanging on walls and in atriums and lobbies around the world, bring her and her suspended sculpture to exotic places and new audiences. Tuesday, Wednesday, Thursday: 10 a.m. to 8 p.m.